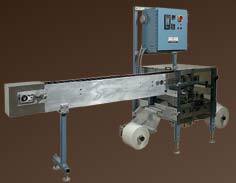 The VWC-008 Vertical Wrapping System is manufactured by GGA Packaging. The Model VWC side-by-side Vertical Wrapping System is designed to individually wrap cutlery or similarly shaped items in a package sealed on four sides. The Vertical Wrapping System receives items placed side-by-side in the conveyor trough for 50% higher feed rates. Double unwind stands enable approximately one full shift of operation without a film roll change.